A day on the beach in Barcelona is so refreshing and relaxing. A long lunch at Bestial only makes it better. Make reservations in advance and be sure to ask for a table with a view outside if preferred. Bestial is part of a larger group of restaurants throughout Spain and Mexico. I’ve visited most of their restaurants in Barcelona and enjoyed them all. It’s always great to find a group that is reliable when traveling. Bestial is one of my favorites, however. What could be better than a great lunch on the beach in Spain watching the Mediterranean? We’re still searching! Vegetarians beware! This is definitely a restaurant for pescatarians. My friends in Barcelona took me to Tanta a few times – it was one of their favorite places and I easily understand why! My Barcelona friends are much more adventurous in their eating than I, so I never know what to expect, but Tanta is truly amazing. In fact, I still have cravings for the ceviche! The atmosphere is ultra modern and fresh and the cocktails are fantastic! Quinoa Salad With avocado, cucumber, tomato, onion and herbs. Yuccas Walking sticks with sauce Huancayo. Rock fishes, squid, shrimp and cassava sauce ceviche. Seafood and classic tiger milk. Octopus Anticucho Grilled accompanied by hash browns and Creole sauce. Butter Fish Anticucho Grilled accompanied by hash browns and Creole sauce. Sea bass and tiger milk yellow pepper. Tuna lacquered with passion fruit syrup. Sea bass and tiger classic milk. Full Roosterfish Gallo boneless fried, bathed in garlic Chifero. Squid, octopus kebab sauce with potatoes and corn. Spicy Ceviche Sea bass and seafood, milk and hot pepper tiger. Nikkei Ceviche Bluefin tuna, tiger’s milk with tamarind and soy. Butterfish, onions, tomatoes, peppers, mushrooms, bean sprouts and oyster. “Sweaty” Corvina in yellow pepper broth, tomatoes and cassava. Bar Cañete was recommended to me by a friend who grew up just outside of Barcelona. I frequently travel alone and consider myself a very savvy traveler – I rely heavily on my instincts and intuition to help keep me safe. Granted, Barcelona is one of the safest cities in Europe. However, as I approached Bar Cañete on a small side street off of the crowded and over-stimulating Ramblas, I had a strong feeling to turn around. A group of intimidating men was huddled around the door – but Alex said this was the place to go so I pushed my way through and found a seat at the bar. The inside of Bar Cañete was very bright and cozy. The long bar faced the open kitchen – always one of my favorite places to sit when I’m dining alone as I enjoy the action of the kitchen and watching the preparation of the food. There was also what appeared to be a small courtyard in the back which brought in a lot of light. Groups of friends were gathered around tall tables enjoying a long lunch break. It had the feel of being a place were everyone knows everyone and those who dine there are regulars. Bar Cañete serves seafood fresh from the Catalan seafood markets and locally grown, seasonal produce and the food is great. The prices were so reasonable that I decided to order almost everything on the menu that was vegetarian. It was a lot of food, but I wanted to try it all, even if it was only a few bites of each. Many of the dishes I had had before, but this is where I fell in love with Spanish Omelets and Padrón Peppers. 7 or 8 dishes, a couple of glasses of wine, and a cafe con leche later my tab was less than 30 euro! This is a great place to stop for some fantastic and authentic neighborhood tapas. And of course…cheeses and desserts! La VinotecaTorres quickly became a staple in Barcelona. It is a bit “touristy”, none of my Spanish friends eat there, however, it’s around the corner from our apartment, has great vegetarian selections, great wine, and outdoor seating. Settled next door to the Gucci store on Passeig de Gracia, the crowd watching is very entertaining. There is also a great selection of desserts including chilled chocolate truffles that serve as a great compliment to the wine! Monvinic is not only my favorite restaurant in Barcelona, but is my favorite restaurant thus far. The ultra modern design is only one way this unique restaurant distinguishes itself. The primary difference, however, is the intense focus on wine. Monvinic is a restaurant second and a wine center first. Instead of using wine to complement food, the food is created to compliment the wine. The restaurant has very limited hours and only one seating a night, Monday through Friday, with a few lunch options. While dinner in Barcelona usually starts after 9:30 p.m., we like to start at Monvinic as soon as they open the doors at 8:00 so that we can enjoy a few hours before they begin to wrap up at 11:00. Reservations are required and I encourage you to make them well in advance. Monvinic is a research center for those who study wine. There are a few study rooms that line one side of the space with books and bottles lining the walls. The glass enclosed wine cellar is very well stocked and the wine list is presented on an electronic tablet viewable by varietal, country, region, and more. The by the glass list changes throughout the night as the waitstaff, all of whom are sommeliers, decide which bottles to open next – as one bottle is finished they choose a new one. My recommendation is to enjoy by the glass, or I prefer half pours, so that you can taste a variety of wines. Your server will perfectly pair your dish with your next glass and will time your meal on how quickly, or slowly, you consume your wine. On some visits I stick with only Spanish wines, on others I leave it all to the recommendation of the staff. The dinner menu is projected on the wall. One side of the projection is in Catalon, the other side rotates between Spanish and English. The menu is somewhat limited, however, I have never struggled to find a complete 3-4 course meal. There are always a few seafood options, after all, you are only a few blocks from the Mediterranean. Some of my favorites include the egg and truffle small plate, the morels with cream sauce, and all of the fish that I have had is perfect. Between every course you will be served an amuse-bouche. Many of these are not vegetarian friendly, blood sausage seems to be a favorite here, however, if you notify your server of your dietary preferences they will make sure you are well informed of all the ingredients. Although the meals is large, be sure to save room for dessert and coffee! Also be sure to check the website for events during the dates you will be in Barcelona. 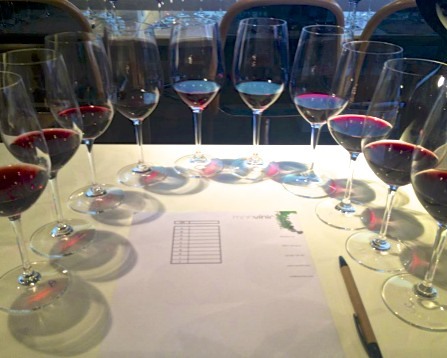 On my last visit I was able to get reservations for a blind Grenache tasting that was truly spectacular. These are all in Spanish, however you can usually find someone to help translate the bits that you can’t figure out on your own.